Look for stippled needles, especially on older growth. 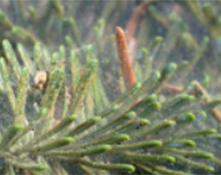 The spruce spider mite injures the needles by inserting its slender mouthparts and sucking out the sap. The puncture causes a stippled, bleached discoloration. 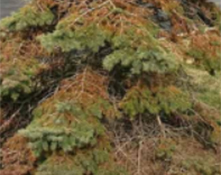 In severe infestations the needles become dingy yellow or brownish and often needles dry and drop off. Damage is usually first noticed on the lower inside branches but spreads upward and outward as the infestation progresses. The mites spin fine silken webbing throughout the twigs and needles. The webbing is most noticeable on the underside of the branches where dust particles, dead needles and dead mites adhere. 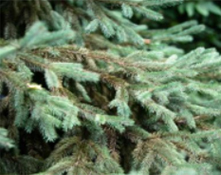 In spruce plantings, infestations can persist for years resulting in reduced tree vigor and eventually death. Recently planted trees, nursery seedlings, or trees under stress are especially susceptible to serious injury. This mite overwinters in the egg stage on buds and needles. It is active during cooler weather in the spring and fall. Nymphs are present in spring as saucer Magnolia or Norway Maple begins to bloom. Look for active spruce mite infestations in the fall as goldenrod is blooming. Mites will be visible with a 10x hand lens. Old eggshells will be clear; viable eggs are red. Young nymphs are red, turning dark green as they mature. To check for mite infestations, vigorously shake a branch over a piece of white paper, then rub your hand across the paper or press the paper in half. If red smears appear, mites are probably present. Trees should be checked regularly since mite populations can increase rapidly. Heavy rain accompanied by high winds and extreme temperatures are means of natural control. Some control can be achieved by washing infested trees with a strong jet of water. Low numbers may be controlled by predatory mites if they are present. If miticides are needed, select specific miticides that spare predators. Horticultural oil and insecticidal soap must be applied at high pressure so the spray penetrates the inner branches and webbing. A second application within 7-14 days is advised.